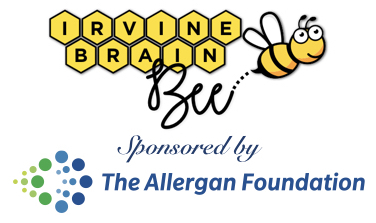 We are pleased to announce that the Allergan Foundation has partnered with the UCI Center for the Neurobiology of Learning and Memory as the headlining sponsor of the Irvine Brain Bee. Based in Orange County, the Allergan Foundation supports charitable organizations and programs that have a bold impact on communities where Allergan employees live and work. The Irvine Brain Bee is hosted by the Center for the Neurobiology of Learning and Memory at UC Irvine and is organized by a committee of CNLM Ambassadors led by Manuella Yassa, Director of Outreach and Education. The goal of the Irvine Brain Bee is to inspire high school students in Orange County to learn about the brain and provide opportunities for engagement with university students and professors. Upon registration, Brain Bee participants will be matched with a mentor who will guide the student as he/she prepares for the competition. All Irvine Brain Bee competitors will have the opportunity to participate in a workshops and review sessions at UC Irvine in preparation for the competition. The 2019 Irvine Brain Bee Competition will take place on February 16, 2018 on the UC Irvine campus from 9am to 4pm. In addition to the competition itself, the day will include neuroscience demonstrations, hands-on activities, lunch with neuroscientists as well as panel discussions and a keynote lecture. The competition is 100% free for students. The winner of the Irvine Brain Bee will be invited to compete in the USA National Brain Bee and will win a trip to Hershey PA to participate. All competitors will receive a gift bag, shirt and certificate. We would like to thank the Allergan Foundation for their partnership and dedication to the youth of the Orange County community.